I love a good book-lined hallway but I always wonder: would I ever get to where I’m going if I had to pass along one? 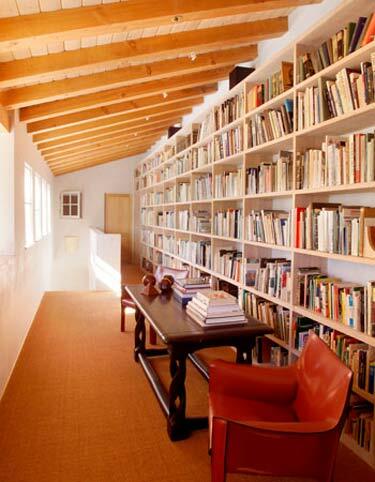 Or would I just end up distracted by all those beautiful books? I think I would have to pull the chair underneath the windows so the light would be coming over my shoulder and wouldn’t be glaring in my face as I read. Otherwise, this is great. I love the table and its extra stacks. This one isn’t for me … I’m not keen on beams and the colour overall is mainly a shade of orange, not my favourite colour either. On the plus side: loads of shelves for books! The table is lovely, admittedly, but this is a corridor with what look to be stairs at the end. It’s not a place I would wish to remain longer than finding the book I was looking for … I’d then be away and out of this space. There’s never anything wrong with a whole lot of books, no matter where they are. But I’d worry about spines fading in this hallway. It doesn’t look cozy and inviting either, so I don’t think you’d find me lingering there. Is it a hallway? It looks like a landing space, at the top of stairs and under a sloping roof. I grew up in a chalet-style house, with bedrooms up in the roof, and if this space was mine I would love it so much – but I’d change the floor , and the table, and the chair, and have it all chintzy blue, white and yellow, with vases of flowers, and pot plants,and rugs, and baskets with more boos stacked in them, and lamps with shades to match the chair, and little chintzy cotton curtains… it would be a cross between my childhood bedroom and Milly-Molly-Mandy’s little room, and I’d never want to leave!!! Oh well, I can dream. Oh, that’s pretty. I’d love a space like that.